1. 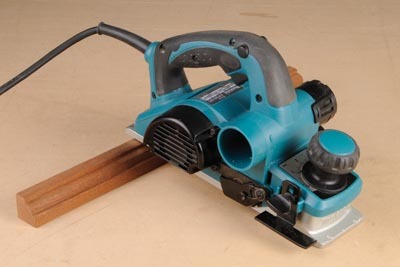 If you own a planer without a flip down safety stop to prevent blade contact with surfaces, keep a piece of timber handy to rest it on (see photo 1). 2. If you don't have an extractor available, place a large board facing the chippings outlet side of the machine so the waste falls neatly in a line on the floor blade. 3. Professional planers such as this have a more complex blade setup. It is better to pick one that takes quick fit reversible blades that do not need resharpening (see photo 2). 4. 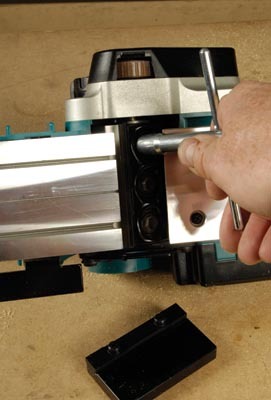 The straight fence that comes with a planer usually has holes for fitting a larger sub fence. This can make it easier to make proper 90 degree passes (see photo 3). 5. When planing critical long edges, technique is everything. Make sure the cable is unobstructed so you can make one long pass, thus avoiding dinks and unevenness caused by stopping partway. 6. Although some jobs require heavy planing passes to remove stock, often it may be trying to straighten an edge. Mark the edge as accurately as possible then take light passes, giving more attention to areas that need them, then finish off with a long through pass. 7. 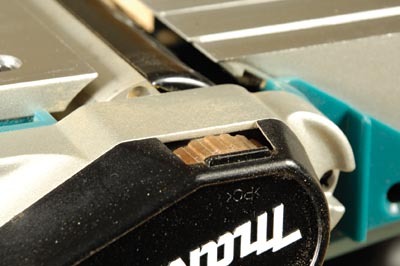 Some planers have an exposed drive belt underneath, so take care it doesn't get damaged (see photo 4). 8. 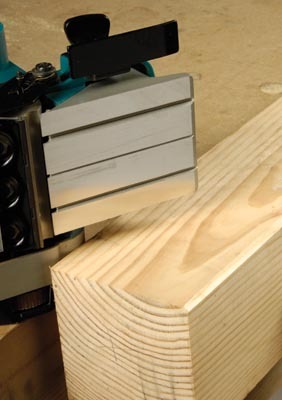 As a quick alternative to a router when breaking arrisses, use the planer V groove guide to do an accurate bevel cut (see photo 5). 9. 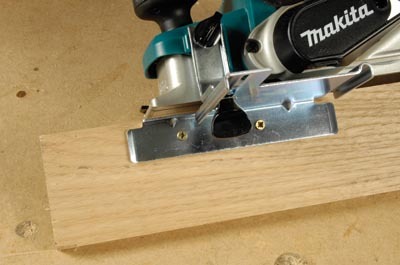 Planers are often used to trim existing woodwork, however nails and screws can lurk beneath the surface. Use a metal detector first to check for this. 10. Keep the cable up over your shoulder, avoiding an obvious but easily forgotten hazard of planing through your own cable. It does happen!